These past few years have been a particularly rocky few for me. And I think it's fair to say I lost my way a little, prioritised everything other than my own personal well-being. So this year, 2016, has been my emotional recovery year. I began by eating healthier foods, trying to eliminate the processed foods I'd been guiltily relying on, focusing on the things that make me happy. Surrounding myself with the people I love, starting to eliminate those who bring negativity to my life, doing the things I'm passionate about (which is how blogging came about) changing my career path, really focusing on what it is I want. This has all helped. But it wasn't quite enough. I needed self confidence, I needed to let go of all the guilt and regret and negativity, to start trying to shake off all the anxiety. And that's where this lovely little book fits in. So, where did I hear about it? Well, Alexis Ren is a huge inspiration to me. Her Instagram feed is beautiful, and in one of her pictures, she was reading a book called 'The Four Agreements'. I'd heard of this book in passing before, and decided to look into it, as Alexis is a huge role model to me. So I googled it. It came up with 'The Four Agreements: Practical Guide To Personal Freedom'. Personal Freedom was exactly what I had been struggling for. So I headed on over to Amazon, and brought it. 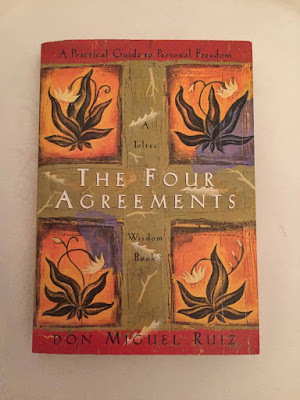 This incredible little Toltec book written by Don Miguel Ruiz, sums up how, as children, we are programmed to think and act in a certain way, and this stays with us as we progress into the adult life. Turns out to live a free life, we need to break ourselves of these habits, as they restrict us from living that happy, free life. Each of the Four Agreements are broken down and explained chapter by chapter. Its easy to read, straight forward, and every agreement makes sense. It is easy to understand how we let society rule our lives. This agreement teaches you to use the spoken word to spread love. It is a gift to us, we should not use it as a weapon. Everyone's issues are their own. They are nothing to do with you. Think about it for a minute. Every issue is the result of the individual. It is not your fault. This makes so much sense. There is no point assuming anything. If you want to know, ask. don't sit there imagining every possible scenario possible. You are literally worrying over nothing. No one can ask anything more of you, than your absolute best. It is not an easy task to take on, having to reprogram the way you think. It's a gradual process. Since discovering this little book I have begun to realise how these agreements really do make you self aware and enhance the enjoyment of life. It is not easy and I often catch myself trying to revert back to my old 'habits' but I can't punish myself for that. I can only praise the fact that I have realised what I'm doing is not going to help me move forward. Love this post! I've heard of this book from several YouTubers that were talking about it. Such a positive way to live life. Great things to keep in the back of your mind to live a happy life. :) I'll definitely have to give it a read some time.